The Birmingham Faith Leaders Group (BFLG) met on the 17th anniversary of the shocking events of September 2011. The Group is composed of the principal leaders of Birmingham’s six major faith communities – Christians, Muslims, Sikhs, Hindus, Buddhists and Jews. The Group grew out of the immediate aftermath of the tragedy of 9/11 and the threats made to the Muslim community at that time. An initial gathering of faith leaders on the steps of Birmingham Central Mosque on 12th September 2001 led to the formation of the Group. During the subsequent years the group’s members have worked together to generate understanding between communities and to develop a diverse, faith-based vision for the city. The meeting was held at Birmingham Progressive Synagogue and opened with a reflection from the host, Rabbi Margaret Jacobi. The first order of the day was to hear from Manar Marzouk from the Charity Reset. Reset is a new charity partnering with leading refugee, faith and community charities to promote community sponsorship across the UK. It is working closely with a range of organisations to shape the UK’s community response to the Syrian crisis by building on the existing goodwill and compassion of people across the country. They encourage communities to come together to welcome, support and help refugee families as they rebuild their lives in the UK. The BFLG then carried on with its busy agenda of business covering various upcoming events, project updates, and other faith business. One agenda item was the updating on the Museum of World’s Religions and the Charter for Forgiveness & Reconciliation (CfFR). As part of the update Bhai Sahib Mohinder Singh OBE KSG, reported that excellent progress had been made with Patrons and supporters. 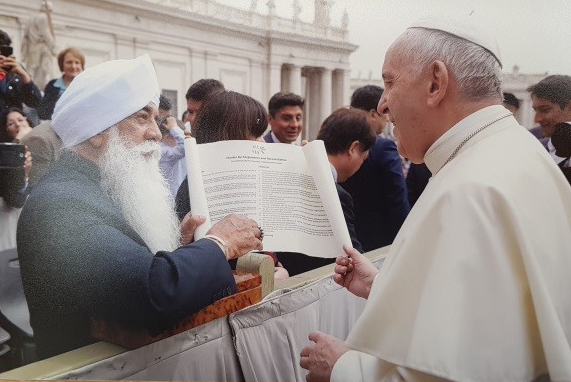 He shared that His Holiness Pope Francis had recently blessed the CfFR scroll and Bhai Sahib Ji invited the Birmingham Faith Leaders to do the same. After the event, Dr Josef Boehle, Director of the Charter for Forgiveness and Reconciliation, said, “The recent events including the appreciation and blessings of His Holiness Pope Francis are wonderful. The fact that the Faith Leaders regularly review and update each other on the Charter’s progress is excellent. Their blessing of the Charter on this auspicious date is even more poignant. The work on the Charter is going from strength to strength and we are planning a major event to launch the Charter next year. The vision of the Charter is to make a contribution to processes of forgiveness, reconciliation and sustainable peace, not only between individuals, communities and states, but also between faith traditions”. 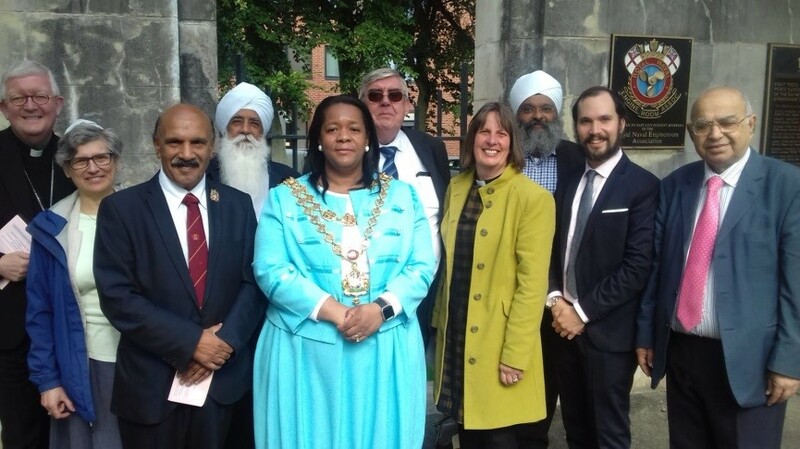 Following the reading and blessing of the Charter for Forgiveness & Reconciliation scroll, the faith leaders made their way to the multi-faith Peace Service held at the Peace Gardens in Birmingham. The aim of the service was to bring the city’s major religions even closer together. The Birmingham Faith Leaders group, which was created in the wake of the 9/11 atrocities, held its annual Inter Faith Service for Peace at the St Thomas Peace Garden in Bath Row. The service originally began in response to hate attacks against Muslims following the Twin Towers attacks. The park itself is a tribute to those who have come to pass during times of unrest, who have suffered loss through terrorism, conflict and social upheaval. We have all experienced loss at some point in our lives and will continue to do so. Though grief is inevitable, it is important to remember those who have perished and to celebrate new life. This concept was clearly represented in the symbolic watering of a rose bush the Faith Leaders had planted in commemoration of the victims of the 9/11 attack. The coming together of humanity to prosper in troubling times and to triumph over strife in hopeful aspiration of the future. The Peace Garden event was attended by a diverse audience with people from many different faith groups coming together to have a minute of silence and pray together. 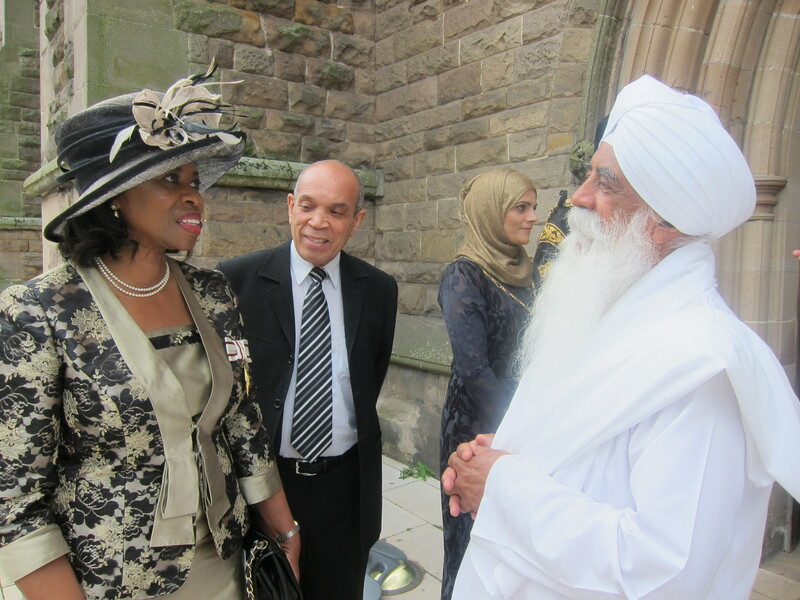 The Lord Mayor of Birmingham, Cllr Yvonne Mosquito, also attended the event. Jonathan Gurling, Executive Secretary of the Birmingham Faith Leaders Group, said: “We try to keep the event very simple and short so more people will attend and stay for it. The Faith Leaders Group was formed when the then Chief Minister at Singers Hill Synagogue, Rabbi Tann, was so incensed by the attacks on Muslims post 9/11, he telephoned Dr Naseem, the then Chairman of the Central Mosque, and asked to visit on September 12th when community prayers were being held. 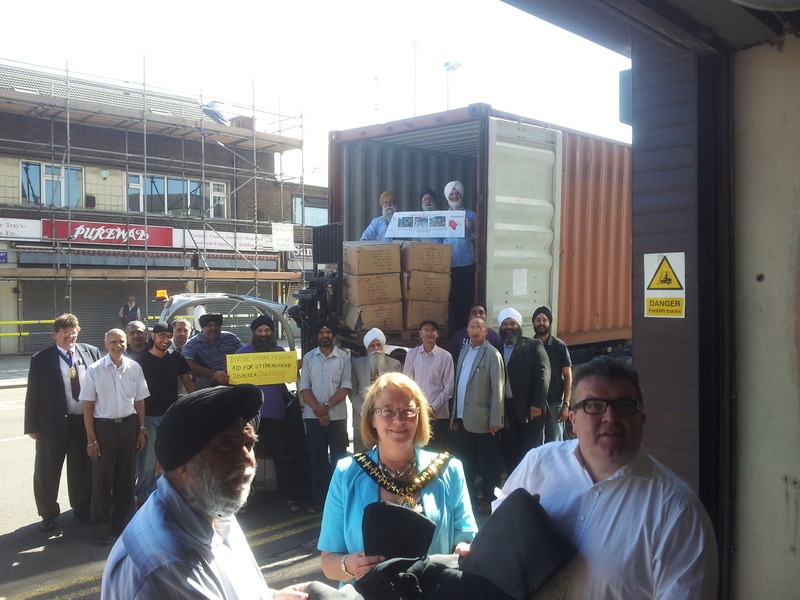 He was joined by Christian and Sikh leaders and the Faith Leaders Group grew out of this simple act of brotherhood”. 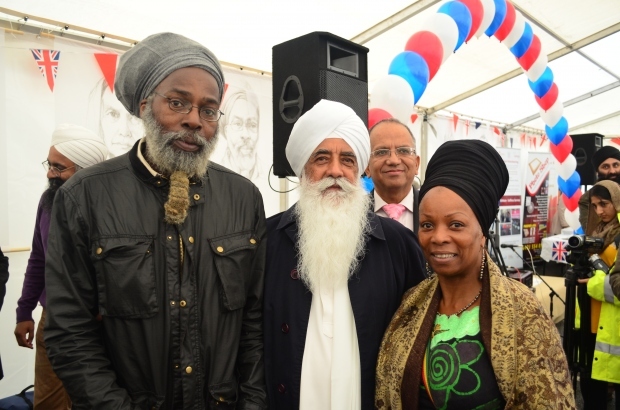 Bhai Sahib, Bhai (Dr) Mohinder Singh OBE KSG, Chairman of the Nishkam Civic Association and Co-Convenor of the Charter, later said, “Forgiveness originates from the Divine and forgiveness is essential in a fractured world. The whole of humanity is one family and we are all interconnected and interdependent. The root cause of conflict is the mind; everything starts in the human mind. It is great to have the Faith Leaders bless the Charter”. As the horrific events of Friday 13th November in Paris unfold and we get more information about the tragic occurrence, our thoughts and prayers go out to all the loved ones of all who have lost lives and suffered. The incident has demonstrated the carnage that senseless individuals determined to take human life can cause. Syria or any other place. Such atrocities are becoming all too familiar reports on our daily news. We should not forget the value of life. It is not about the number of lives lost; one life lost is one too many. We need more faith and community solidarity. People of all faiths and none, and generally good human beings, need to come together and unite. Our planet’s peace has been disturbed through violence, exploitation, conflict and insecurity. It is not religion that is in crisis but rather those who hijack faith to suit their own merciless agenda. We should all condemn the inhumane, barbaric acts that threaten the very sanctity of our society; evil cannot and will not prevail. People of faith are the conscience of the world. We have a duty to speak up and a duty to rally around during times of crisis. We cannot stand by and let the sanctity and value of human life be eroded. We must never forget, as people of faith, that the power of prayer is infinite. It is our shield; it is our saviour; it is our guardian in good times and bad. As stated by the InterAction Council (1st Sept 1997) ‘every person has a responsibility to respect life. No one has the right to injure, to torture or to kill another human’. destructive forces, primarily violent extremism, lust, revenge, greed, and ego. take us into your fold and refuge. Pray, shelter and protect us”. As we mourn the loss of loved ones around the world, we pray that God grants us all the strength to deal with the calamity that faces us. May the many faiths of the world come together in times of crises and stand together united in the face of adversity. There is no challenge that humanity cannot endure when united for the common good and when helping fellow humans. We call on all people of faith to look to your faith; pray for all those caught up in these atrocities and reach out to our fellow human beings. The people of Birmingham paid their respects to the innocent lives lost in recent terrorist attacks, at a candlelight vigil in St Philips Square. The Birmingham branch of national charity Citizens UK held a vigil last night to remember the 129 people who died in Paris on Friday, following a terrorist attack on the city; and also for the hundreds who were murdered in Beirut, Baghdad and Kenya recently. Hundreds of people took part in a minute’s silence, laid flowers and candles; and heard speeches from leaders of different faith groups. Posters and placards featuring peace signs and the hashtags #Solidarity and #NoToTheRacistBacklash were also held aloft during the vigil before being placed beside a French flag and tea-lights. Makhdoom Chisti from Birmingham Central Mosque described the murderous tirade in Paris, led by terror group Daesh (ISIL/ISIS), as “senseless and did not represent Islam”. He fears Muslims are facing a backlash in this difficult time for all. He said: “Islam does not allow any Muslims to take the lives of innocent people regardless of their beliefs. We strongly condemn this incident. A blessing was led by the Bishop of Birmingham David Urquhart. 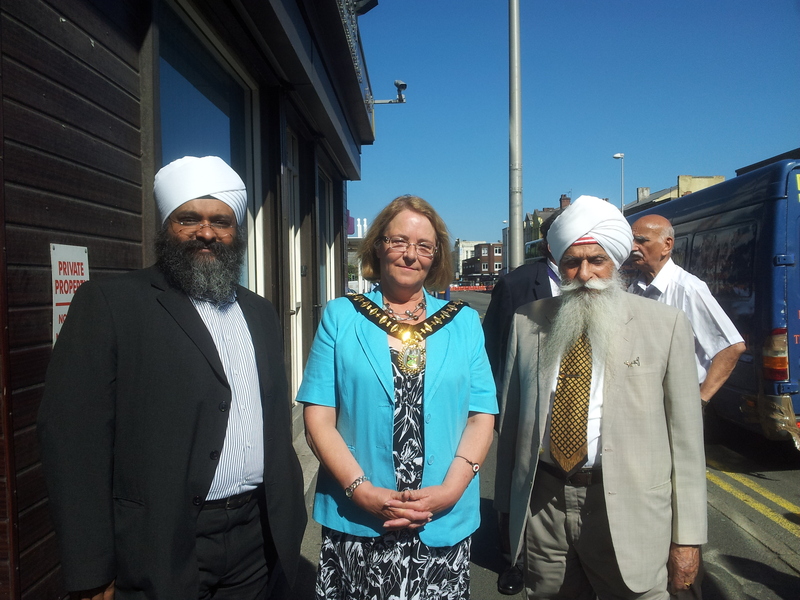 Former Lord Mayor and current Labour councillor Shafique Shah attended the vigil to show solidarity. He said: “The most important thing is today we have people from all faiths here and everyone is condemning these acts of terrorism. Mr Shah does not believe the recent terrorist attacks have changed public opinion of refugees and states Birmingham City Council is committed to housing 50 Syrian refugees in the upcoming months. “As citizens of Birmingham and as people from all faiths and none we have been horrified by the terrorist attacks in Paris. Our thoughts and prayers are with all the victims and families at this traumatic and difficult time. Knowing that this comes soon after the tragedies of the Russia airline, the bombing in Beirut and the ongoing conflicts in many countries including Iraq, Syria and Yemen deepens our grief. We are gathered this evening to grieve and to show our compassion and solidarity with those innocent victims of the attacks. Also in attendance were representatives from the Jewish community including Ruth Jacobs and Rabbi Margaret Jacobi, Chairman of the Nishkam group Bhai Sahib Dr. Mohinder Singh, prominent anti-war campaigner Salma Yaqoob, Dean of Birmingham Cathedral Catherine Ogle, former city council leader Sir Albert Bore and members of Stand Up To Racism Birmingham, a group promoting community cohesion and solidarity with refugees. “My deepest sympathies and condolences go to all those that lost loved ones and were injured in the attacks in Paris and Beirut. I feel very strongly about such incidents because my father was murdered by a Ukrainian fascist terrorist and I am still struggling to cope with this tragic loss in my family. “I also feel strongly about these events because my father was a Muslim and he was murdered by a fascist terrorist who bombed mosques in the West Midlands. Quite rightly, we do not equate all white people with this terrorist, but why are all Muslims treated as potential terrorists? “My father and my family are Muslims and the victims of terrorism. In August Mushin Ahmed an 81 year old Muslim pensioner was murdered in Rotherham. I fear there could be more similar attacks if the approach of depicting all Muslims as terrorists continues. On Saturday, a day after the wave of attacks in Paris, the Library of Birmingham was lit up in the French Tricolore. The Guru Nanak Sikh Temple in Smethwick also paid tribute to the resilience of the French people by being lit up in red, white and blue. While in Highgate, condolences were shared at the Birmingham Central Mosque and at the Sultan Bahu Trust in Balsall Heath. “We wish to share our sincere condolences, thoughts and prayers, to the families and friends of those killed and injured in the horrific terrorist attacks in Paris last night. “We also stand in solidarity with the people of France and the world, who have been affected and are in mourning,” mosque Chairman Muhammad Afzal stated at an official press conference. The 21st September 2015 saw dignitaries and distinguished guests invited to the House of Lords for a meeting organised by the Buddhist Society of which His Holiness the Dalai Lama is Patron. Bhai Sahib Bhai (Dr) Mohinder Singh OBE was the Sikh representative at the prestigious meeting entitled ‘The Preservation of Religious Culture and the Cohesion of Faiths’. Bhai Sahib Bhai (Dr) Mohinder Singh, Chairman of Guru Nanak Nishkam Sewak Jatha and Nishkam Civic Association, was honoured to be part of the meeting. The meeting was followed by a Celebration Lunch to mark a double celebration firstly, the 80th birthday of His Holiness The Dalai Lama and also the Buddhist Society celebrating its 90th Anniversary. “Education is the answer to many of society’s problems. We must educate children with good values and virtues. Good role models enable them to be good human beings”, said Bhai Sahib Ji. Bhai Sahib Bhai Mohinder Singh Ji & Dali Lama, “ Being happy is not a matter of destiny. It is a matter of options. “Take care of your thoughts because they become words, Take care of your words because they will become actions, Take care of your actions. Painting by GNNSJ volunteer, Charan Singh. Archbishop Kevin McDonald conveyed greetings to His Holiness and members of the gathering from Cardinal Vincent Nichols, leader of the Roman Catholic Church in the UK. He also recalled serving in the Vatican when Pope John Paul II convened the ground-breaking interfaith gathering in Assisi in 1986 that His Holiness had attended. 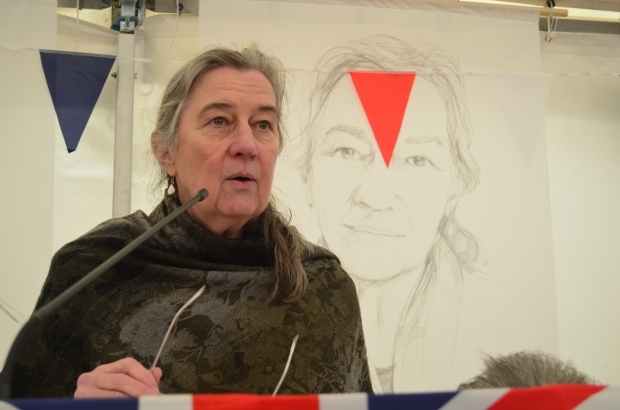 Baroness Berridge, Chair of the All Party Group on International Religious Freedom, raised concerns for atrocities against Muslims and Christians in Burma and elsewhere. She eloquently said that those in public life had a responsibility to work for the rights of all. Her sentiments were taken further by the Bishop of Coventry, Christopher Cocksworth, who iterated that violence has never helped and religious leaders needed to make this clear to their various governments. He said there was still too great a sense that military force was the way to solve problems, but in fact in the long run words are more effective than bullets. The Dalai Lama repeated that love and compassion are what bring people together, while anger and suspicion push them apart. He drew attention to three aspects of religious tradition. The religious aspect concerns the common practice of love and compassion, tolerance and self-discipline. While philosophical views may be quite different, they are all dedicated to the same goal of reinforcing the practice of love. However, he said, there may also be cultural aspects of religious tradition, like caste discrimination, which the Sikhs do not subscribe to, that are no longer relevant and should be changed. He said he encourages religious leaders to speak out about these things whenever they can. The meeting concluded with the guests making their way for lunch in the Strangers’ Dining Room of the House of Commons. The Civic Service held at St Martin’s Church in the Bull Ring provided a serene setting to officially mark the welcome of the new Lord Mayor of Birmingham, Councillor Shafique Shah. The opportunity to renew commitments to public service for Birmingham and its citizens and to ask God for his blessing set the scene for the next term of office. The Annual Service at St Martin’s Church in the Bull Ring on Sunday evening 20th July 2014, was a moving and inspiring service that all the guests and visitors seemed to enjoy. Led by Revd Elisie Blair-Chappell the service proclaimed the greatness of the City of Birmingham and the power of faith and spirituality to guide and inspire our civic leaders. The event saw former First Citizens, their partners, distinguished guests from all walks of life at the Church service. Following the service at the Church the hosts and guests made their way on a beautiful summer evening to the Banqueting Suite at the Council House for refreshments. At the Civic Service and reception, The Lord Mayor was accompanied by his wife Sadia Shafique, the new Lady Mayoress, and two of their young daughters. 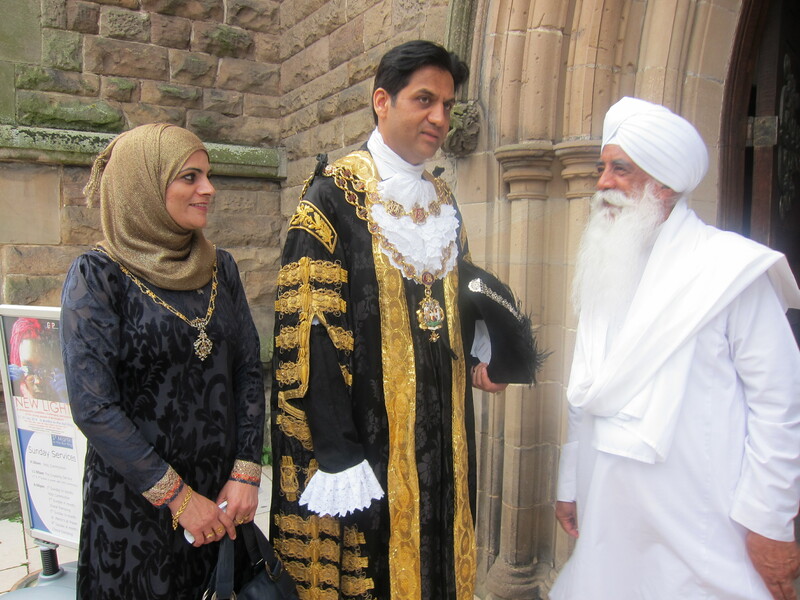 They were introduced to Bhai Sahib, Dr Mohinder Singh, Chairman of the Guru Nanak Nishkam Sewak Jatha which manages the activities of the Gurudwara on Soho Road and Chairman of the Nishkam Civic Association, who congratulated the Lord Mayor on his appointment and the great church service. The Lord Mayor was impressed to hear from Bhai Sahib Dr Mohinder Singh about the Museum of World’s Religions being created here in Birmingham and the international Charter on Forgiveness and Reconciliation that Bhai Sahib is leading on. Bhai Sahib, Dr Mohinder Singh, commented on how pertinent and important the service was. “The fusion of spirituality and secularity is crucial. Our civic leaders empowered with faith virtues will always make the right decision for the common good and in the interests of the whole city. They need to operate from a values foundation; principally if they recognise the significance and importance of spirituality they will do well”. On leaving the Church, Bhai Sahib, Dr Mohinder Singh complimented both Revd Elisie Blair-Chappell and Cannon Jones on their contribution to the service and invited them to visit the Gurudwara and Nishkam Centre on Soho Road. Birmingham Focus a sight loss charity. In a graduation ceremony held in the magnificent surrounds of Birmingham Town Hall on Tuesday, 15th April 2014 three leaders joined more than 520 postgraduate students from across Aston’s four Schools to receive recognition. 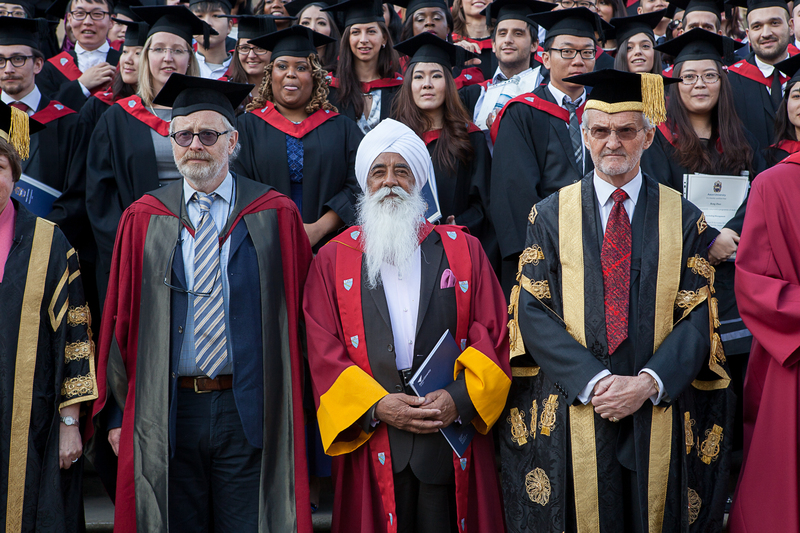 During the 2014 graduation ceremony, the University awarded three honorary degrees to leading religious and business figures. They were Sue Noffke, an equity fund manager; Bhai Sahib, Dr Mohinder Singh Ahluwalia, Chairman of Guru Nanak Nishkam Sewak Jatha (GNNSJ) and the Nishkam Civic Association and The Very Reverend Catherine Ogle, Dean of Birmingham. The Senate is empowered to award degrees ‘honoris causa’ as a means of honouring individuals who have distinguished themselves in a particular field or profession, or who have given meritorious service to the University. 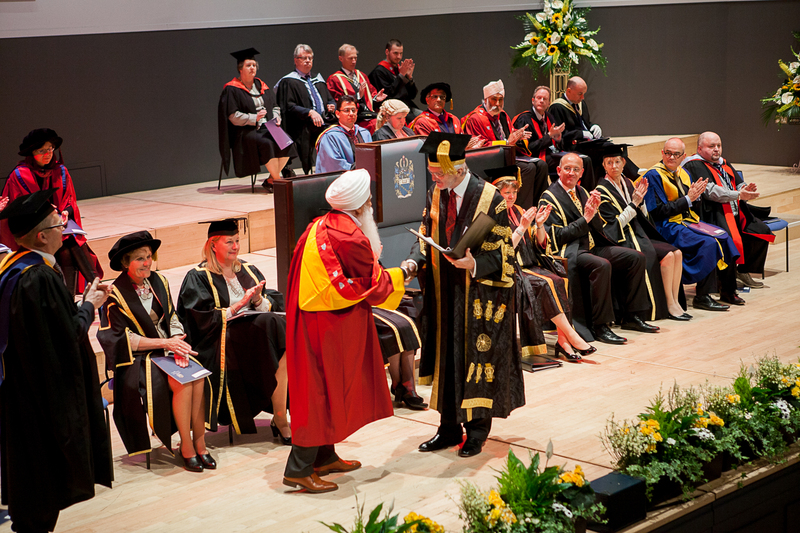 The Honorary Degrees are the University’s public recognition of an individual’s outstanding achievements or service at a local, national or international level. It is particularly appropriate if the achievements or service are directly related to Aston University and / or Birmingham and the West Midlands, or to the principles for which Aston University stands: the advancement, dissemination and application of learning and knowledge, by teaching, and research, for the benefit of industry and commerce, and of the community generally. Bhai Sahib Dr Mohinder Singh Ahluwalia is the Spiritual Leader and Chairman of Guru Nanak Nishkam Sewak Jatha, UK – a charitable organisation with its Headquarters in Birmingham and two sister organisations in Leeds and London with branches in India and Kenya. 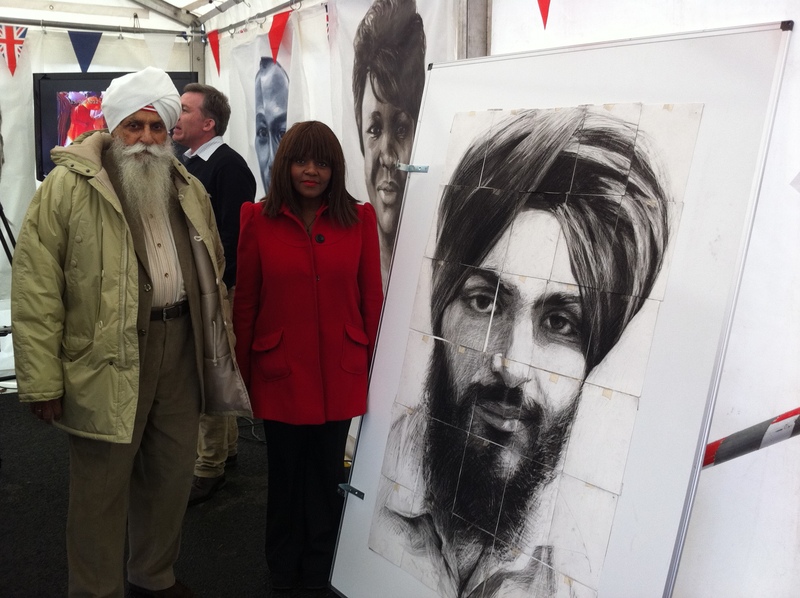 He is also Chairman of the Nishkam Civic Association which engages in a plethora of civic activities. He has previously been awarded honorary doctorates from the University of Central England in 2002 and from the University of Birmingham in 2006. Bhai Sahib is the first British Sikh to be awarded the official title of ‘Bhai Sahib’ by the Shiromani Gurudwara Parbandhak Committee (the Sikh ‘apex’ organisation representing some 26 million Sikhs globally) for his selfless service in propagating the Sikh faith, engagement in interfaith work and heritage conservation. 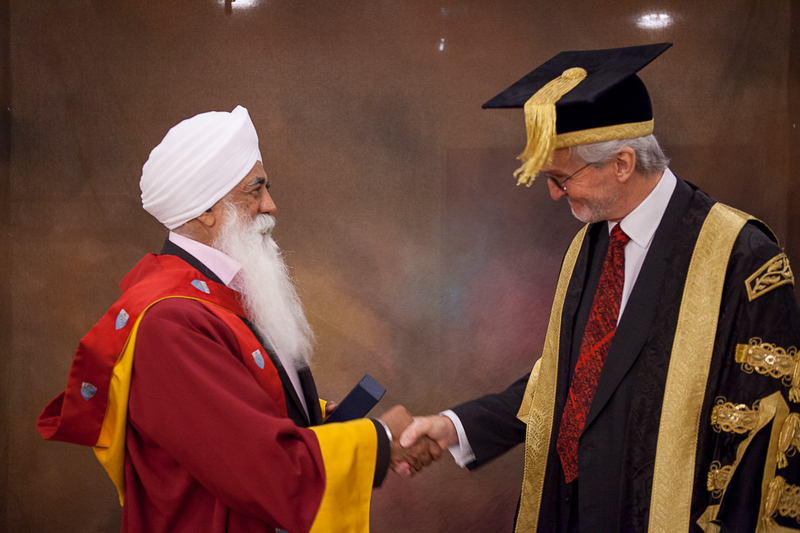 Bhai Sahib said ”It is indeed a privilege and an honour to be recognised by such a prestigious University well known for its world-class teaching, and strong links to industry, government and commerce”. Within the interfaith context, Bhai Sahib is a senior member of the Elijah Board of World’s Religious Leaders and the European Council of Religious Leaders. He is Co-President and Trustee of Religions for Peace International, New York, and President of Religions for Peace UK. He supports the Council for the Parliament of the World’s Religions, Chicago. Bhai Sahib is Patron of the Divine Onkar Mission, Anon Care (UK), the Nishkam Healthcare Trust and the Nishkam School Trust which has pioneered a multi-faith ethos in values-based education at its Nishkam Nursery, Primary, High School and Sixth Form. He is currently working on two landmark projects; an ‘International Charter for Forgiveness and Reconciliation’ and a Museum of World’s Religions to be located in Birmingham. During his address to the gathered graduates and their families he said, “While this is a day of celebration for those who are graduating, it is also an occasion that represents departure from studying at Aston University to a new world stage where graduates have the opportunity to make their mark in the wider community, whether that is at a local, regional or indeed at global level. The true value of your education lies in how you transfer the knowledge you have gained for the greater good of communities and humanity at large”. ‘The whole of the human race is but one large family’ states Guru Gobind Singh Ji our tenth Guru. With this universality of the Almighty, we humans have common origins, common destiny and common goals. Pain, suffering, grief and tears are all common to us. We inhabit the same planet and share the same common environment. “Once again, I am deeply humbled by this honour and I trust that as graduates you will take advantage of the rich legacy of our great city“. Hundreds of community members from across Handsworth and the surrounding areas joined together to celebrate Her Majesty the Queen’s Diamond Jubilee, a Year of Service and the shaheedi (sacrifice) of the Guru Arjan Dev Ji – the 5th Guru of the Sikhs. Event partners included Guru Nanak Nishkam Sewak Jatha (GNNSJ), Birmingham Faith Leaders, Birmingham Council of Faith, WM Faith Forum, the Nishkam Civic Association (NCA), West Midlands Police, Birmingham City Council, Central Mosque, Buddhist Vihara, Religions for Peace, Hindu Council of Birmingham, Nishkam Nursery, Jubilee Debt Campaign, Nishkam Primary and High Schools, Birmingham Churches Together, Soho Traders, Faizul Qur’an Jamia Masjid and of course Job Centre Plus who made the venue available. Organisers celebrated in style by setting up a marquee so that the forecasted rain did not disrupt proceedings. Hosted on the busySoho Road, the event included personal reflections, stalls and exhibitions, children’s events, free food and a traditional “shabeel” serving refreshment to attendees and those simply passing-by. For some, the highlight was an exclusive showing of art work by Daniel Connell, which gave visitors the opportunity to meet the artist, watch him at work an d view his latest collection. The exhibition created opportunities for dialogue and reflection between diverse communities using portraiture. Birmingham’s faith representatives took to the stage to share their message of peace and tolerance and also give their personal congratulation to Her Majesty the Queen, expressing their gratitude for the freedom, dignity and generosity with which she rules her great diverse nation. The speakers sharing personal reflections included inspirational figures like Moqapi Selassie, Arvinder Jain, Ramona Kauth, Matloob Hussain, Dinesh Chauhan, Sajida Madni, Bill Ozane, Cllr M Hussain and Parmjit Kaur. Each of them gave a clear message of thanks to Her Majesty and also messages of cohesion, unity, peace, love and the welfare of all. Speaking at the event, Chairman of GNNSJ and the NCA, Bhai Sahib Dr Mohinder Singh said, “Today is significant on many levels, but the key messages are about commitment with an unambiguous sense of duty / Dharam or righteousness. There is a need to uphold values, sacrifice, selfless service and a belief system based on the dignity of others. We need to have a clear understanding of justice, whilst being a role model for others to aspire and emulate. The Year of Service, a Government sponsored initiative, highlights the voluntary service people of faith carry out in their local communities. It gives each faith community an opportunity to share their faith or a project with the wider population. The Sikh community chose June for Year of Service because it allowed the marking of the shaheedi of Guru Arjan Dev Ji, who lived a life in service to humanity and devotion to God. The pictures of the day have been shared with the HandsworthCelebrates website. This is a website celebrating the success of events in Handsworth and Lozells to allow people to share stories with all – see www.handsworthcelebrates.com. 3. Guru Nanak Nishkam Sewak Jatha (GNNSJ) is a multi-faceted, faith based Organisation practising and propagating the Sikh Dharam (faith) in the name of Guru Nanak Dev Ji (1469-1539). It has been involved in selfless intra-faith work inKenyaandIndiainformally since 1950, and formally in theUKsince 1978 as a registered Charity through five centres for excellence in the inner-city depressed area of Handsworth,Birmingham, where its Headquarters are based. GNNSJ also has sister organisations in Leeds and London (UK); as well as in Kericho (Kenya) andDelhi/Amritsar(India). Significant achievements have been made by GNNSJ in the conservation and restoration of historical Sikh shrines. 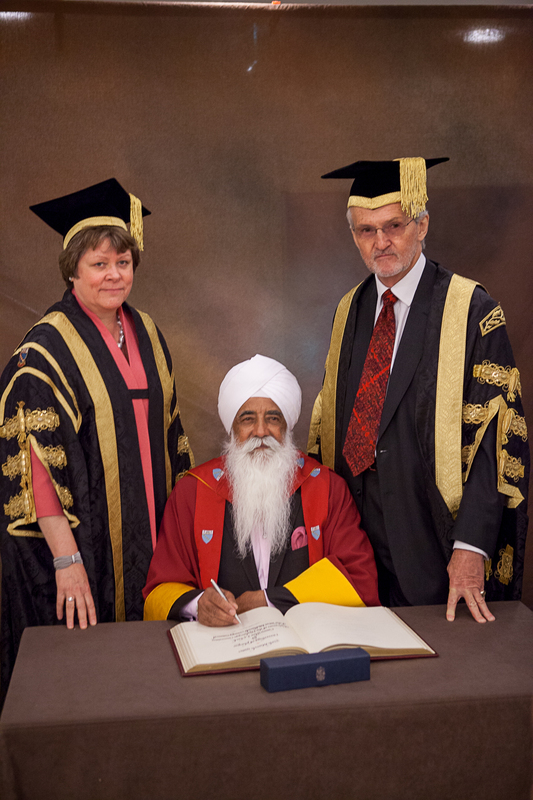 Chaired by Bhai Sahib Bhai Dr Mohinder Singh, who holds two honorary degrees from the city’s universities, it aims to serve and uplift society through the practice of core values – nishkamta, or the spirit of selflessness, being one of them. Inspired by spirituality, GNNSJ has generated a flourishing culture of volunteering, which has contributed immensely to transform its visionary projects into a reality. Bhai Sahib was also recently created a knight by the Holy Father Pope Benedict XVI in recognition of his dedicated work for Roman Catholic Sikh relations and for his enthusiastic commitment to working for peace among people of all faiths.